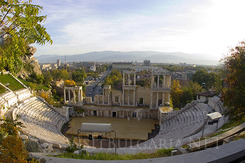 This year the International Technical Fair in Plovdiv will be held from 26th September – 01 October. This is the most renowned Bulgarian forum of investment goods and technologies. The International Technical Fair presents the latest developments of the world's leading companies in machine building, automobiles, transport, information technologies, software products, electronics, electrical engineering, construction, chemistry, power engineering, ecology, etc. This year's Partner Country of the International Technical Fair is the Russian Federation.